Dave Whamond is the award-winning author of Oddrey (winner of the Blue Spruce Award). He also has a syndicated cartoon strip called Reality Check, which appears daily in a number of North American newspapers. Dave lives in Calgary, Alberta, Canada. JENNIFER STOKES has been a children’s book editor for almost twenty years. She works from home, living in Toronto with her husband, three children, and a quirky black-and-white cat named Moo. Frank and Laverne is her first book. Every morning by 06:00 hours, Frank is awake and on duty for Squirrel Patrol. This pug takes his role seriously: basic training, neighborhood surveillance, and, most importantly, protecting his humans and the cat, Laverne, from the Great Dane next door. Laverne, however, prefers a more refined lifestyle of napping, kneading her cat bed, and scorning humans’ ridiculous behavior. As much as Frank loves her, the deadpan Laverne loathes Frank. She dreams of sending him away forever and claiming his fish-shaped chew toy for herself. 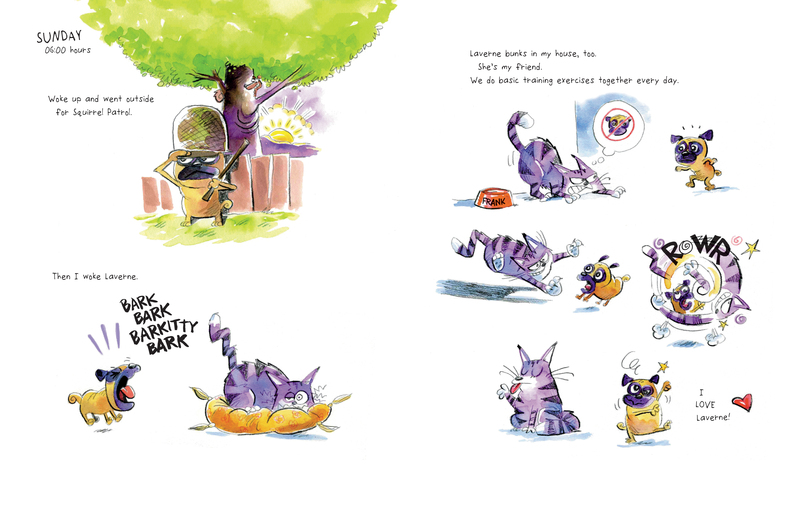 Both pets report their perspectives separately, from opposite ends of the book, until the story comes to a head in the middle with a single encounter Frank and Laverne perceive in very different ways. 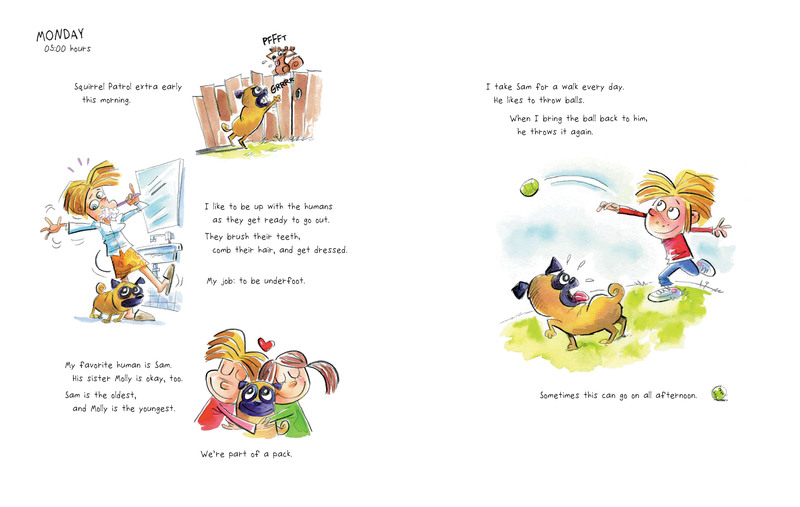 Written in the style of a daily log with text and illustrations interspersed, the story abounds with verbal and visual humor that will appeal to reluctant readers. Rich vocabulary, onomatopoeia, and the play on opposing points of view make this a smart, laugh-out-loud pick for critical reading.